In an 11-0 vote Thursday morning, the City Council approved Erik Walsh as the new city manager of San Antonio. It’s a promotion for Walsh, who will be leaving his post as the deputy city manager overseeing the police and fire departments, the Office of Emergency Management, the Metropolitan Health District, and the 311 public service. He begins March 1, immediately after City Manager Sheryl Sculley officially retires after 13 years on the job. He’ll earn a maximum of $312,000, and can serve no more than eight years—both limits placed on the city’s top position when voters approved Proposition B in November. Walsh started working at the city 24 years ago as a budget analyst, Nirenberg said. Much of the dialogue between City Council members and Walsh at Thursday’s meeting was perfunctory and ceremonial in nature. 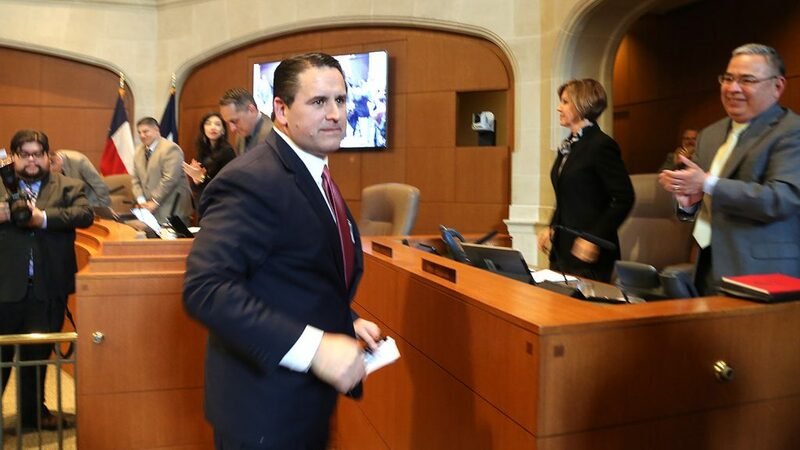 The Council had already chosen Walsh as the only finalist Jan. 16, after a weeks-long interview process with other candidates, the majority of whom were the rest of Sculley’s deputy and assistant city managers. Some Council members glowed about the appointment of Walsh, while others were less enthusiastic. District 5 Councilwoman Shirley Gonzales went as far as to admit that Walsh wasn’t her first choice, nor second, at the beginning of the process. “I say that because I felt that the priorities of my district—equity, housing, transportation—you are not that familiar with,” said Gonzales, who largely serves the near West Side. She recalled a public meeting where Walsh, a native San Antonian who attended Central Catholic High School and Trinity University, was asked by West Side leaders how well he knew the West Side. “And you couldn’t answer,” Gonzales recalled. “After an additional meeting, I recognized that I think you have all the skills necessary to make sure District 5 doesn’t get left behind over and over again,” she said . District 3 Councilwoman Rebecca Viagran echoed some of Gonzales’ initial concerns about Walsh’s lack of experience when it comes to matters of economic development and equity—the lifting up of San Antonio’s less prosperous districts. She then gave Walsh an opportunity to respond. Sculley received intermittent praise from a few council members, and also from Walsh. Other council members also recognized Assistant City Manager María Villagómez, who was one of two finalists before the council singled-out Walsh two weeks ago. Walsh’s selection comes three months after voters overwhelmingly approved Proposition B, which limited the salary of future city managers to no more than 10 times the amount of the lowest paid city employee, and the tenure to eight years of service. A few weeks later, Sculley, who makes $550,000 in salary and bonuses, announced she’d retire in 2019.